Lovingly cared for oceanfront home! Bring 18 of your family and closest friends comfortably together in this 6 Bedroom, 5 bath home right on the beach! Central heat and air, wireless internet access, multiple flat screen HDTVs, DVD player. Fully equipped kitchen includes Dishwasher, Washer/Dryer, Microwave. All seasons enclosed 2nd floor porch for beach gazing, reading and naps in the sun. Plenty of comfortable space for outdoor living. 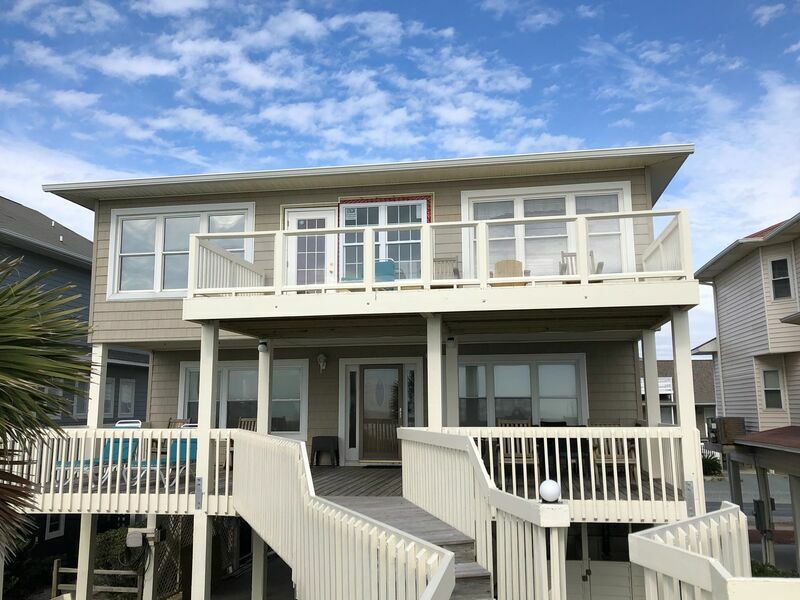 Sundeck on the Dunes, Covered Porch, gas grill in a maintained BBQ area. Sleeps 18. First Floor Bedding: 2 Doubles, Queen. Second Floor Bedding: 2 Doubles, 2 Doubles,1 Double, Queen. Save $500 in June, week of June 15-22, 2019 only. Act fast, this offer won't last long! Book today. Save $500 in June, week of August 3-10, 2019 only. Act fast, this offer won't last long! Book today.